World in Motion: There is no way you are putting a giant pretzel inside me! There is no way you are putting a giant pretzel inside me! I can't stop laughing over this new spot for M&Ms! 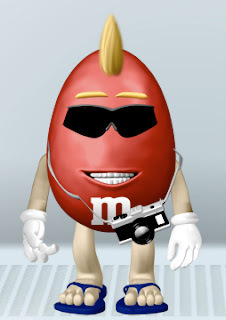 It was created by BBDO New York, the advertising agency for M&Ms since 1995. This new spot that brings back Orange, the M&M "spokescandy" is very well done, and hilarious. Orange and his newly acquainted friend Mr. Pretzel are surrounded by scientists trying to figure out a way to get Mr. Pretzel inside Orange. The spot is looking to advertise M&Ms newest candy to hit the stores the "Pretzel M&Ms". 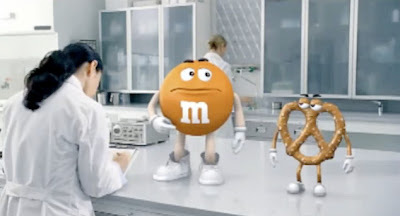 After failing over and over, Orange can't seem to convince those behind this new line of M&Ms not to go ahead with their evil plan. Mr. Pretzel even humorously responds with "Listen buddy, I'm not too thrilled about this either". The spot eventually ends with an X-ray showing Orange and Mr. Pretzel right inside of him. These types of spots have certainly been a trend with M&Ms in the past. The agency tends to always use these humorous characters to advertise their products. In addition to that, M&M also does a great job with getting consumers involved by even allowing them to create their own self as an M&M! Anyways, why not take a look at the spot yourself and let me know what you think!